Published on behalf of the Australian Museum of Motion Picture and Television (AMMPT). 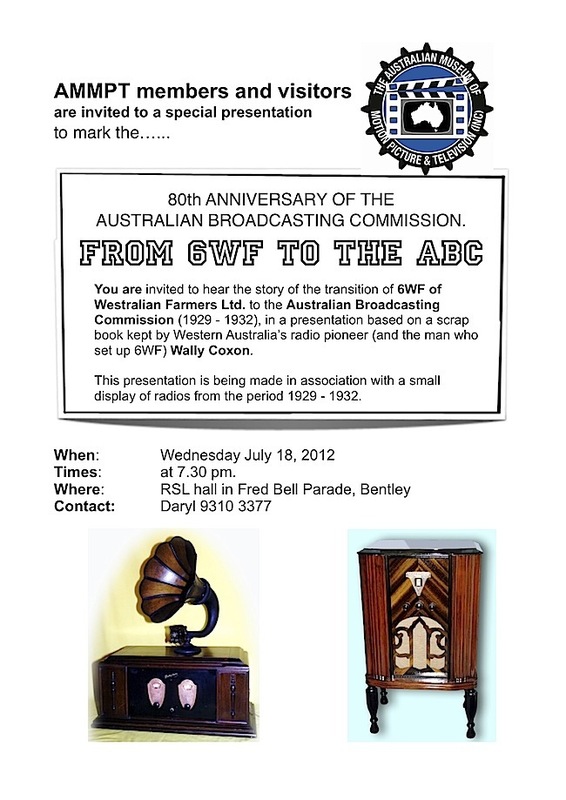 Next Wednesday July 18th is the AMMPT member’s meeting night at the RSL hall in Bentley. 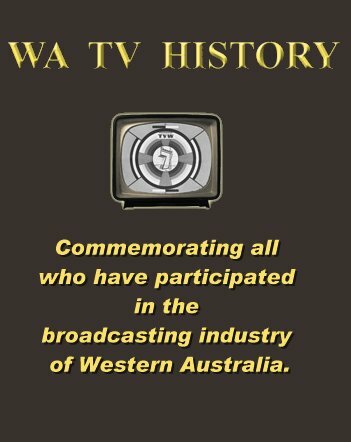 As previously promoted at http://watvhistory.com/2012/05/classics-of-the-silver-screen/ the main event for the evening will be a presentation by Education/Exhibition officer, Richard Rennie on the history of local ABC radio station, 6WF, or 720AM as it is now known, This will be followed by the usual refreshments then screening of a couple of interesting short films from the Museum’s 16mm library. Visitors with an interest in the local radio history are also invited to attend. To enable AMMPT to properly host these visitors, would all members please wear their membership badges to the event. Holders will be available for those who do not have one. This Sunday at the usual AMMPT monthly fund raising film show at the Cygnet Cinema in Como, the National Committee member and legendary theatre organist John Fuhrmann will provide pre-show and interval entertainment on AMMPT’s own organ installed at the cinema. In northwestern India soon after the turn of the 20th Century, Moslem rebels seek to kill a six-year-old Hindu prince to end his family line. Captain Scott (Kenneth More) of the British Army is ordered to get the prince out of the region safely. Adventure ensues as Scott sneaks the child away, through Moslem-held territory, by train. Also on board are the boy’s feisty American governess Catherine Wyatt (Lauren Bacall); a suspicious half-caste called Van Leyden (Herbert Lom); Bridie, a stereotypical British gent (Wilfred Hyde-White); the arms dealer Peters (Eugene Dickers), as well as Lady Windham, (Ursula Jeans). 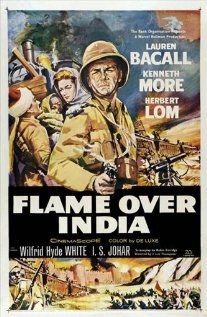 This film was also known as “Flame Over India”. 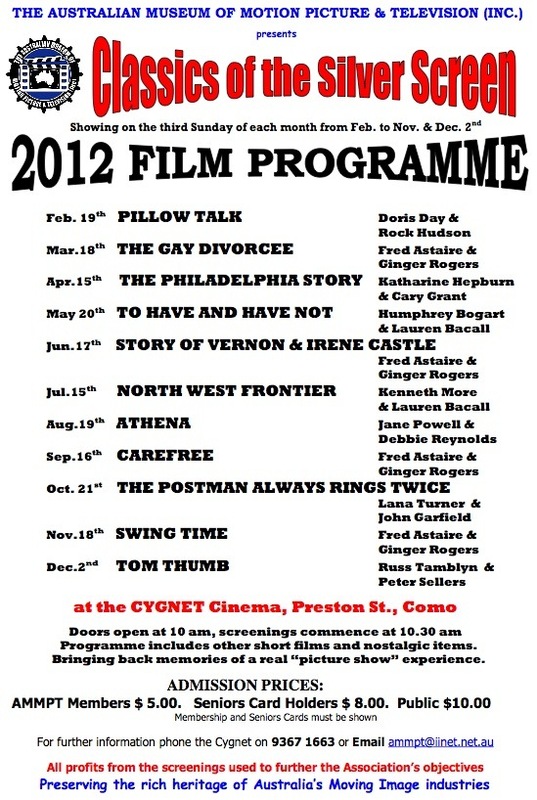 Programme includes other short films and nostalgic items. Bringing back memories of a real “picture show” experience. AMMPT Membership and Seniors Card must be shown. 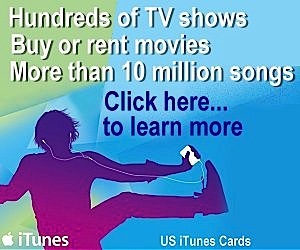 All profits from the screenings used to further the Association’s objectives. Preserving the heritage of Australia’s Moving Image industries. Please dont forget – Saturday August 4th for the visit to the hugely successful RAAFA museum in Bullcreek. As the venue is specially being opened for the AMMPT tour, it is essential those intending to go along please indicate to Daryl Binning on 9310 3377 by Thursday August 2nd. The presentation at AMMPT’s regular September members event will be by Screenwest, which is currently trying to assist the museum in finding storage facilities. Please encourage others to join AMMPT as there is an increasing amount of work to be done, in particular relating to the many significant professional television related items recently received into our collection. AMMPT Western Region President, Ross McDonald.